Win over the support of leaders, project managers and sponsors with meaningful metrics and tangible results. Like any CM practitioner (or advocate), you will increasingly be faced with the challenge of providing hard numbers (or facts) to prove CM effectiveness. Fear not, as advances in the field have made the task much easier to handle. Remember that your scoreboard should include performance variables at the organizational, individual and CM levels. Here is everything you need to implement a robust measurement strategy. Before we dive into the nuts and bolts of performance measurement at each level, keep in mind that there are roughly five types of criteria commonly used to assess change effectiveness. Adoption metrics focus on how employees adhere to the change, that is to say, the percentage of user adoption and proficiency in new processes. Qualitative/feedback metrics relate to the perceived effectiveness of change among employees and end users alike, as collected through multiple channels or formats: surveys, informal feedback, clients’ satisfaction reports. Employee performance metrics describe variation in performance, efficiency and behaviour after changes have been implemented. The overall project performance metrics track progress towards overarching goals / deadlines and highlight benefit indicators such as Project ROI. Last but not least, readiness assessments cover a lot of ground … from determining where people find themselves along the ADKAR continuum to measuring stakeholders’ engagement, organizational awareness and resistance. #Organizational Performance: Did the initiative deliver what was expected? This, in a nutshell, is how success is defined. You may assess change readiness and track overall progress towards the envisioned future state by measuring adherence to project plan, speed of execution and deadline compliance. Value realization should be highlighted through project KPIs measurements and ROI. #Individual performance: How effectively did people adopt and use the change? Measuring individual performance is perhaps the most powerful way to report on CM impact. Considering that change is a process that “happens one person at a time”, ADKAR surveys are of great help in monitoring individual progress, starting with people being aware of the need to change … to getting equipped to utilize the change (Awareness, Desire, Knowledge, Ability, Reinforcement). Other tests, assessments, observations and performance evaluations can shed light on adoption and utilization rates (including proficiency with the solution – error logs and requests for support are extremely valuable indicators), employee readiness and engagement or subsequent behavioural changes. #CM performance: How well did we do Change Management? Looking into actual activities carried out under the CM umbrella (alignment with best practices) is a requisite step to measuring CM effectiveness. Even if it seems most obvious, remember that these metrics are no isolated parts of your reporting efforts and should always be considered in connection with the two other sets. In order to determine whether CM application was / is effective, it is necessary to take into account sponsorship efficiency, amount of CM dedicated resources, whether or not there is a well-rounded and structured approach, engagement rate, etc…. So, win over the support of leaders, project managers and sponsors with meaningful metrics and tangible results. It’s your move! 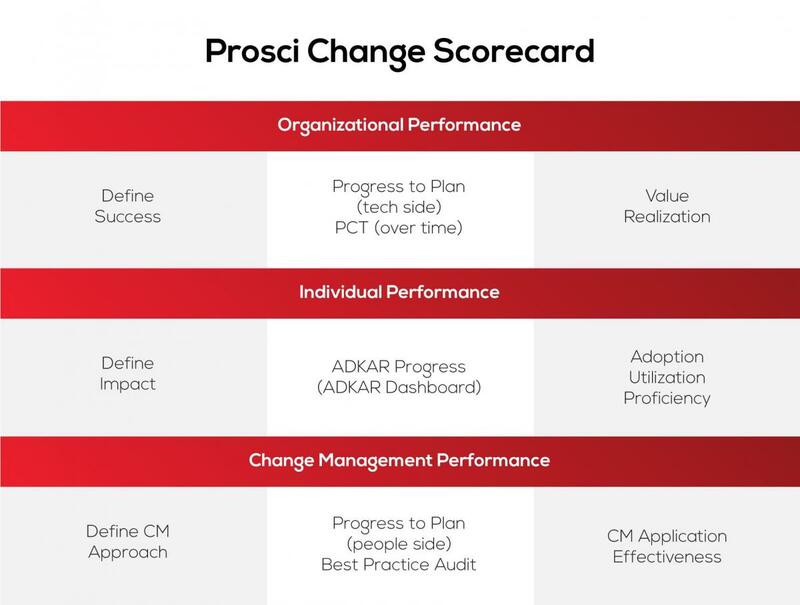 PROSCI (2018), Measuring the effectiveness of Change Management. PROSCI (2016), Criteria used to measure change management effectiveness, [PROSCI Change Management Library].